The project was among three wind farms the Seattle-based online retail giant said will help its cloud-computing subsidiary, Amazon Web Services, run on nothing but renewable energy someday. The other generation facilities are a 91.2-magawatt project in Ireland and a slightly smaller plant in Sweden. A spokesman for Amazon said the company will not own the Kern County installation but will buy energy generated there from an unidentified third party. 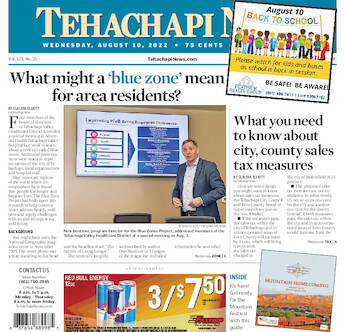 County Planning Director Lorelei Oviatt said the county had been unaware of Amazon's intentions and did not know which Tehachapi-area wind-energy project the company was referring to. She noted by email that, based on the company's announcement, it is "definitely buying the power from a private developer through the grid." Amazon said the wind farm the company will buy energy from in Kern is unrelated to the product distribution center Amazon is building just north of Bakersfield across Merle Haggard Drive from Meadows Field Airport. Peter DeSantis, vice president of global infrastructure and customer support for AWS, said in a news release the wind energy projects are well-positioned to serve AWS data centers in Ireland, Sweden and the United States. "We expect more projects in 2019 as we continue our goal of powering all AWS global infrastructure with renewable energy," he stated. State Sen. Jerry Hill welcomed the project. "This announcement from AWS is great news, not just for California but for the entire country, as it reaffirms our role as a leader in renewable energy and allows us to take an important step forward on deploying the clean energy we need to respond to climate change," Hill, D-San Mateo, said in Amazon's news release. Amazon said AWS was able to power half its global infrastructure with renewable energy in 2018, and that it has a "long-term commitment" to power its equipment with only renewable energy. The three wind farm projects announced Monday are expected to generate a total of 670,000 megawatt-hours of energy. (One megawatt hour is enough to power 330 homes for an hour, according to solar energy website CleanEnergyAuthority.com.) Together, the three projects bring AWS's total renewable generation capacity to more than 2.7 million megawatt-hours, Amazon stated. Amazon said it has "enabled" 53 wind and solar projects around the world producing more than 1,016 megawatts of energy, and that together they are expected to deliver more than 3 million megawatt-hours per year. The company recently announced a goal of making all its shipments "net zero carbon," meaning the company's system for delivering goods will have an overall neutral effect on carbon-emission levels. It pledged to hit the 50-percent mark by 2030. As part of its efforts toward greater use of renewable energy, Amazon said it plans to put rooftop solar-energy systems at 50 of its fulfillment centers by 2020. It was unclear whether the distribution plant being built in Kern will be among them.